The 'Kickstarts' hitmaker hasn't been able to release his sixth studio - the follow-up to 2014's 'Live Life Living' - because he's waiting on his record label to allow him to put it out. 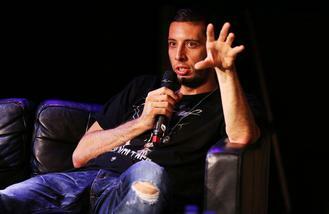 Example - whose real name is Elliot Gleave - exclusively told BANG Showbiz: "I've had an album ready for over a year now. The industry's changed, I mean you don't see a lot of records; people only want to put out a single. So I mean if they want to put out an album." However, that hasn't stopped the 34-year-old rapper from continuing to write new material for it, he's compiled a staggering 50 songs so far this year. Asked if he's still working on it, he said: "I've written 50 songs this year! Its ready. If not, I'm just going to continue writing songs." Example - who is married to Australian actress Erin McNaught, with whom he has 19-month-old son Evander - says he's never had so much "inspiration" and he spends every day in the studio." He said: "I find it really easy to find inspiration at the minute. I have a studio five minutes from where I live, and I'm in there every day with my bass player and my guitarists if I'm not on tour." Example, Little Simz and Toya Delazy mentored 20 UK and five South African students at Nando's Music Exchange workshop at the Roundhouse on Tuesday (12.07.16).